5G – Hype or Reality? The news recently has been full of mentions of the upcoming 5G cellular network upgrades – at least the news articles that I read have been, which may say more about me than it does about the wider population’s interest in 5G – but the fact remains that 5G is just around the corner and it will have implications for comms data and cell site analysis – the question is, though, how much of an implication does the arrival of 5G have for us? Before we look at the implications, let’s put this all into context: the cellular industry brings forth a new generation of technology roughly every 10 years – 2G GSM was released in 1991, 3G UMTS was launched in around 2003, 4G services began to appear in around 2011 and now 5G is nearly here. EE has indicated that it will be launching limited commercial 5G services in 2019, Vodafone already has a test network running in Cumbria and the other operators, plus potentially a new entrant to the UK cellular market, will all be launching in a very small way next year. Large scale 5G rollouts aren’t expected until 2020 or later though, but 5G has already launched in other parts of the world – one of the Australian operators announced that they’d switched on some 5G services this week and AT&T in the US has started selling 5G-enabled MIFI and home broadband devices. Like all previous network generations, a 5G network can be divided into three area – devices, radio access networks and core networks. Some 5G-enabled devices have already been released and handset manufacturers like HTC have promised that they will have compatible devices ready in time for the limited launches by EE and the others. It’s likely that the 2019 versions of the more popular handsets from Apple, Samsung, Huawei, etc will support an initial set of 5G frequency bands as well, but mass support by all vendors is unlikely to happen before 2020. The radio access network side of things – the base stations and radio cells that provide a network’s coverage – is more developed, with most network equipment vendors, like Nokia, Ericcson, Huawei and others already offering ‘5G-ready’ kit. The 5G core network, the part of the system that connects calls and directs data traffic to the Internet, is known as the 5GC (5G Core) and is the part of the system that is currently the least ready – 5GC specifications have only just been finalised and fully-working examples of 5GC aren’t likely to appear for another couple of years. The 5G radio system, known as NR (or New Radio), was specifically designed to allow for the early rollout of 5G services, with the specifications development being divided into two phases, one that allowed the NR to be made ready and further phase to work on the 5GC. 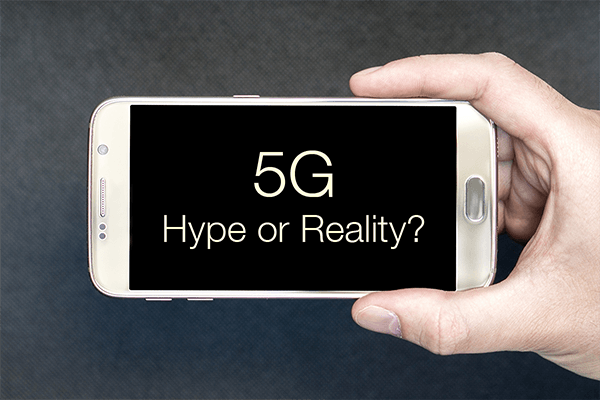 All of this adds up to a lot of marketing hype with a small kernel of actual 5G coverage inside, but even the limited 5G rollouts envisaged by the UK operators for 2019 might result in a need for forensic examination and analysis – so, back to (but paraphrasing) the original question – ‘what does 5G mean for us?’. The simplest answer is, for the time being, ‘less than you’d think’! 2) Non-standalone mode – is where a new gNB is connected to an existing 4G core network and is providing 4G services via a 5G cell. The expectation is that all initial deployments of 5G will be in non-standalone mode, meaning that 4G services will be provided via new, faster, 5G cells. Calls will continue to be connected via the IMS, as in 4G networks. CDRs will therefore continue to be generated in the 4G core and shouldn’t be any different to the billing data we currently get. 5G cell IDs are structured in the same way as 4G cell IDs, although the can have more digits in them, so apart from events being tagged as having used a 5G cell, we’re not expecting any initial changes in the disclosed comms data for 5G events. As far as cell site analysis and RFPS are concerned, there will need to be changes – for a start, none of the existing RF equipment will survey 5G cells, including our very expensive NEMO Handy test phones based on Galaxy S9s, so there’ll need to be some investment in new equipment for organisations who undertake RFPS work. Part of the problem is that 5G will use different spectrum to existing networks, with deployments in the 700MHz, 3600MHz and 28GHz bands taking place around the world. Another aspect of 5G that might cause problems for RFPS is a feature known as ‘network slicing’ – this is a type of ‘network virtualisation’ feature that allows different virtual networks to be deployed that share the same physical network and use different logical allocations of network capacity. In practice, this means that the resources of each physical network elements can be sliced into different allocations of capacity or functionality that can in turn be reserved for the use of a subset of customers or users. For example, a physical network operator might create a logical slice to support its own home broadband service and another slice to support its mobile broadband customers – although both sets of customers are connecting to the same cells, the capacity allocations they get are managed separately, meaning that the operator can offer different levels of service to different groups of customers. The network slices that an individual customer is able to access are configured in their service profile and are managed via their SIM. In theory, a network might decide to allocate entire cells to specific network slices, meaning that only handsets containing SIMs that are permitted to use a specific slice will be able to access those cells. In short, the SIMs used in RFPS devices may not necessarily allow the user to survey all cells, only the cells that support the slices the SIM is subscribed to. This may or may not turn out to be an issue once 5G networks fully launch – it’s only likely to be an issue in standalone 5G operation in any case – but further supports the argument I put forward in a recent blog about the use of hybrid scanners for RFPS work in the future. One further aspect of 5G to consider is ‘dual connectivity’ or DC. 4G introduced a concept known as Carrier Aggregation (CA), which allows a phone to be allocated capacity on more than one cell concurrently to increase the data flow that’s possible. In 4G CA all of the cells the phone is assigned to must be controlled by the same base station, so it’s really a way of allow a phone to access multiple ‘stacked’ cells. 5G supports CA, but it takes it further by allowing some of the cells to be controlled by a neighbouring base station – so the phone is concurrently connected to multiple cells that belong to two different base stations, but one of those base stations acts as the controller with the other base station being subordinate to it for those connections. Sounds like it should be a billing nightmare, but in both CA and DC, only details of the ‘primary’ cell are captured in the CDRs, making the CDRs simpler but losing the ability to better localise the phones’ likely locations by working out the overlapping coverage areas of the two sets of cells. In essence, I’ve used 1,200 words to say ‘5G is coming next year, but nothing much will change for comms data analysis initially and RFPS surveyors will need to buy some new phones’. We’re launching a one-day 5G Forensics Overview course in the new year that will go into all of the above in more detail and we have also enhanced our very popular Next Generation Comms Data Analysis course to cover these topics as well. CSAS and CDAN will be updated if and when there are any comms data changes and we’re actively trying to get indications from the network operators as to any CDR changes that 5G may cause – but as mentioned above, we’re not expecting this to happen. Things will probably change again in 2020/2021 when 5G standalone mode becomes possible, but initially, as Public Enemy were wont to say back in the day (whenever that was) – don’t believe the hype! As always, very well explained by Joe…I will be looking forward to the next Blog.